What a weekend, so many memories, so many laughs and just a little vomit for good measure. The Wales Tour 2015 was a roaring success which we hope will live long in the kids memories and where we hope many a friendship was forged. Whether it was watching Mary “Paulie O’Connell” Griffin leaping like a salmon in the line out or watching Noel “Pavarotti” Flavin forgetting the words to “Everywhere we go” (or even thinking it was a song in the first place!!) or maybe it was watching Luke “Ashton” Landers performing a swan dive as he scored a try, the tour will have left a lasting impression for a variety of different reasons for many years to come. But the main reason we were over in Wales was for the kids and they were fantastic. So many of the kids came of age in a rugby sense during the matches it really was a joy to see (it must have been the international opposition that made them up their game!!). They were wonderful ambassadors for the Club and for our town and they made us all very proud – well done kids. As for the adults, well thats a different story and as the old Chinese proverb says, what goes on tour, stays on tour. We would like to say a huge thank you to our main sponsor Nutribio and all our other sponsors who gave so generously towards the tour programme enabling the kids to have a momento of the trip. Thanks also to Ian/Rob/Eve and all the other staff members at Celtic Camping who really went out of their way to make our stay a good one. Thanks also to John Daly and Peter Coady for getting us home safely despite Peters best efforts at trying to wreck the gear box!! Thanks also to all the kids/adults that went on the tour and got into the spirit of things which really made the tour a special one – we hope everyone enjoyed themselves. Finally, a huge word of thanks to Valerie Fitzgerald, Valerie O’Shea, Yvette Dignam, Tessie Anderson, Aidan Finn and Ivan O’Flynn who organised the trip – its not easy organising a trip of this magnitude so well done and thank you for all your hard work. 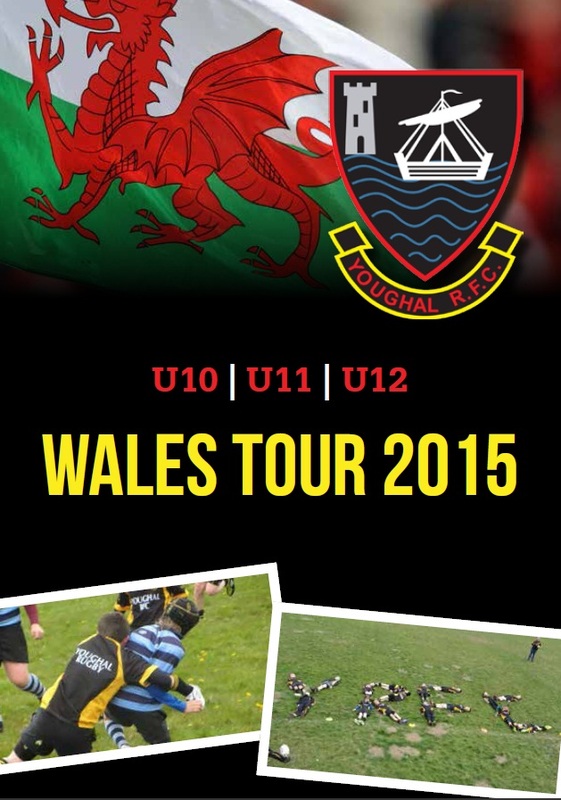 Our under 10’s squad travelled to Wales for their first taste of international rugby recently. 11 of the 12 players in the squad were playing on their first tour, so nobody would have been surprised if the squad were a little bit nervous as they realized they were representing their nation. The team was captained by Mark O’Neill who chose to allow the hosts to tip off which gave Youghal the advantage of playing downhill in the second half. Wales under Warren Gatland has been seen as a big, tough, power running team but this clearly starts from under 10’s up, as St. David’s barged over for their first try after only 2 minutes. Mark immediately gathered his troops and after warming into the game centres Jack Finn and Eoin Faherty were beginning to cause problems for the St. David’s defence with some great passing and running rugby. As their partnership grew, their defence got stronger and stronger led by Ronan Keane with some superb tackling who also didn’t miss a tackle all game. Youghal continued to pile the pressure on the St. David’s defence with some outstanding running rugby from Bobby Nicholson who made the Welsh lads look dazed as he ran past. As Youghal edged closer to the line, Luke Landers led the team from the scrum half position in to a pick and drive situation and P.J. Morgan barged over with help from the whole team for an outstanding try. St. David’s immediately wanted to take advantage of using the slight hill on the pitch and score a try just before a break, but an outstanding defensive effort from Finn O’Brian and Jason Innes made sure it wasn’t easy for the St. David’s team to score. Bobby Nicholson led from the out half position with big try saving tackles but the Youghal lads were unable to hold out and St. David’s went over for their second try. After a lengthy team talk from Aidan “Joe Schmidt” Finn the Youghal team went out looking to use the hill to their advantage. They didn’t disappoint as Eoin Faherty continued to pile the pressure on the St. David’s defence as he was helped by super rucking from Suzanne Dignamm and P.J. Morgan. Eventually Youghal got the beak through they needed, a knock on from St. David’s allowed scrum half Luke Landers to scoop the ball and find a massive hole on the wing as he zigged and zagged through the St. David’s defence to “Swan dive” over the try line almost giving coach Conor Finn a heart attack in the process and giving Youghal their second try. Youghal finally seemed to have found their second gear but this try seemed to light a fire under the Welsh lads and they attacked, attacked and attacked but some outstanding tackling and leadership from Mark O’Neill and from Luke O’Shea (although one maybe have been a little high Luke) helped inspire the Youghal lads to a superb defensive display on their own line. The team were not used to the Welsh rule of no ripping and were unfortunate to give up a penalty which led to a St. David’s try. Youghal continued to put pressure the St. David’s defence and vicea versa which saw Skipper Mark O’Neill make a huge tackle but injuring himself in the process leaving the Youghal team down to 9 players and St. David’s took advantage scoring their fourth try. Aidan Finn once again gave the team another tough team talk remenisant of brother-in-law Eddie O’Sullivan, this seemed to inspire the team and with Mark refusing to succumb to his injury the lads found one last gear. This allowed the “Clashmore Tank” Ciaran Ryan to step up to the plate after an outstanding first half of tackling and rucking to do what he does best: put his head down and rumble over any opposition in his way. After making a lot of ground Youghal were up on the St. David’s line which they turned over but were unable to hold on to as they knocked on into the arms of P.J. Morgan and he literally rolled over for a simple try to the dismay of the St. David’s team. Youghal continued with their onslaught of attack and with power running from Ciaran and Ronan helped by great recycling of the ball thanks to Suzanne and Jason, Youghal were inches from the Welsh line in search of the equalising try. From there, Luke “Swan Dive” Landers sniped around the ruck but was unfortunately tackled short of the line but quick thinking from Jack Finn snapped up the ball and touched down to make the score 4 tries to 4. With only minutes left St. David’s went on one last offensive surge to get a winning try but outstanding defensive efforts from the Youghal team saw Luke O’Shea and Finn O’Brian tackle a Welsh man over the touchline to save a try and that saw the end to a great game of rugby. Afterwards St. David’s Coach Adrian brought both teams together and said that our team had put in the best defensive effort he had seen in a very long time. To finish off I would like to congratulate the whole under 10’s team on an outstanding performance and every one of the team should be very proud against strong opposition and which was of the best games of rugby I have ever watched. I would also like to congratulate the whole touring party on what was a very successful and enjoyable tour. Under 10’s squad: P.J Morgan, Ronan Keane, Ciaran Ryan, Suzanne Dignamm, Mark O’Neill, Luke Landers, Bobby Nicholson, Jack Finn, Eoin Faherty, Jason Innes, Luke O’ Shea and Finn O’Brian. 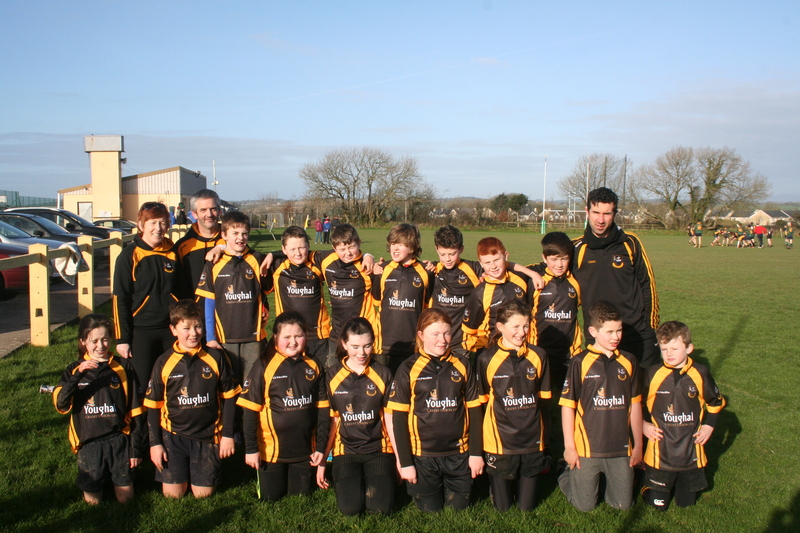 Due to St. Davids not having an U11’s team, Fishguard were drafted in to be the opposition on what was a very windy day. But unlike St. Davids however, Fishguard is no sleepy hamlet and they brought enough players with them to field 2 teams!! Its difficult to say who was the home team on this occasion as the Youghal team had huge support from ourselves and no doubt a few locals also. Fishguard started off playing with the wind and from the kick off it was clear that the wind would play a major part in deciding the game. Fishguard kicked the ball long and heaped on the pressure eventually leading to the ball being turned over. This was the story of the first 15 minutes as Youghal came to terms with a very well drilled team playing at a level of quality Youghal hadn’t come across yet this season. But as the first half wore on, Youghal began to get to grips with the game and in turn the opposition. The number of times Aoibhe O’Flynn or Lauren Ryan got up from the bottom of a ruck or the wonderful tackling by Brian Coleman, Alex Kennedy, Alex Geary O’Keeffe or Jack Griffin was a joy to behold. It wasn’t all defensive work by any means and some darting runs by Sean Hehir and Charlie Flavin or the more direct route chosen by Kyle Anbro were causing Fishguard some problems and it was the lovely ball handling skills of Jake Mulcahy, Nathan O’Halloran, and Enda Cronin which allowed Jack Nicholson to be a thorn in the Fishguard side all day long. In truth this was a fantastic team effort by Youghal who were up against much stronger opposition but played like a team that had been together for years. The international opposition certainly brought out the best in this Youghal team and their level of commitment and never say die attitude was fantastic to watch. It was also a “coming of age” match for a number of individuals and from a coaching point of view this was the most pleasing element of the match – well done to all involved on what was a fantastic game of rugby. For the puposes of clarification, the rumours that a sniper was hidden in the trees and was taking out the Youghal players during the second half actually proved to be untrue in the end but try telling that to Dessie O’Halloran who was on/off the pitch every 60 seconds or so attending to the casualties. We even had our own “Lazarus effect” during the game when a certain player who shall remain nameless suddenly became cured from an injury that required attention on the sideline and subsequently hobbled/walked/jogged/ran (in that order!) back on to the pitch to set up a try for Youghal – this game had absolutely everything!! On a windy morning of the twenty ninth of March, our U12’s took to the pitch in St.Davids Wales to play their first full pitch match and they certainly did us proud. The Youghal side was captained by Rory Lynch who won the coin toss and decided to play against the wind in the first half. Because of the wind, champagne rugby wasn’t an option and a pop pass, pick and go game was played. Sean O’Riordan was the first player to go over the line for a try to put Youghal ahead, which was created by a lot of hard work by the forwards who rucked very well. It has to be noted Sean and Kira Fitz did a lot of hard work in the tight despite playing in the backline. With the wind at their backs St. Davids were able to kick the ball down the pitch which gained them considerable ground and with added pressure were able to go over to level things. The game continued much like this for the first half with Youghal keeping it tight and St. Davids kicking long whenever Youghal coughed up the ball in their half. On one of the occasions when the ball was kicked down the pitch it was picked up by Nathan Daly who took off down the right hand side of the pitch to put Youghal ahead again. However their lead didn’t last too long, after another long kick and some confusion in the Youghal backline St. Davids levelled things up again. Youghal kept the heads up and hit back with more great forward work and Jamie Fogarty going over for a try to put his team ahead again and that’s how the first half finished up 15-5 to Youghal. As Murphy’s law would have it the wind died down considerably in the second half so Youghal could forget about any advantage from it, but with twinkle toes coming to form in the second half who needs a wind advantage – Darragh Kenefick made a lovely run from near half way dancing in and out of players to lenghten Youghals lead. This was followed shortly by another try by Captain Rory Lynch to widen the gap 20-5. However St. Davids didn’t lie down and with some nice hands from their backs scored twice to bring it back to 20-15. That was the last score they were to get. The Youghal backs started putting a lot of defensive pressure on their opponents, won a lot of turn-overs which allowed Nathan and Darragh on separate occasions to get their hands on the ball in space and jink in and out to widen the gap again, 30-15. Next was to come the best try of the game, ball taken on by Youghal forwards then out to the backline with the forwards getting across to support at the breakdown and recycled out to the backs again and with nice hands, Rory Fitz was put into space and with blistering pace took off down the wing to make it 35-15. Another try by Rory Lynch ended the game 40-15. Great team effort by Youghal, the coaching staff are very proud with the win they achieved and the way they behaved on and off the pitch, well done lads. 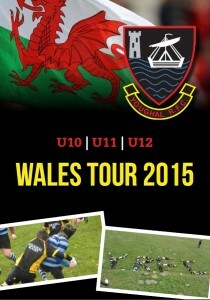 Excitement levels are building as there are only a few more sleeps before the 2015 Wales Tour. After the weekend of 6 Nations rugby we were just treated to, everyone is buzzing with anticipation and really looking forward to the upcoming tour. Youghal Rugby Football Club are delighted to be extending our best wishes to all the players/coaches/parents heading over to Wales on what is now the fifth tour across the pond to our Celtic cousins. We are sure this tour will be as enjoyable as all the previous visits to the land of the dragons. It is such a huge honour to represent your home town on the rugby pitch but very few people get the chance to be ambassadors for their Club on an international level so well done to all the young boys and girls travelling on the tour. As a Club we hope you will all go on to wear the Youghal jersey with pride for many years to come. Playing team sports is a wonderful way of making lasting friendships through shared experiences and the memories you will gain by participating in a tour like this will last forever. 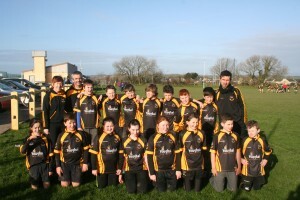 The future is indeed bright for this current crop of youngsters at Youghal Rugby Football Club. We have just completed state of the art dressing rooms and we are currently in the process of providing match quality floodlights on the main pitch which we hope will provide a sound footing to develop the Club in the right direction and have us back challenging for honours in the not too distant future. A lot of hard work has gone into organising this tour and the Club would like to say a special thank you to Tessie Anderson, Yvette Dignam, Valerie O’Shea, Valerie Fitzgerald, Ivan O’Flynn and Aidan Finn for all their hard work and dedication in organising this tour. We would also like to say a special thank you to our main Tour sponsor Nutribio and all our other sponsors who have made this tour possible. We would also like to thank our wonderful hosts St. Davids R.F.C. who always look after us so well. All that is left to say is good luck and have a fantastic time. Ádh mór agus gach dea-ghuí ar na himreoirí agus traenálaí go leir atá ag dul go dtí an Bhreatain Beag – go n-éirí an bother leo. 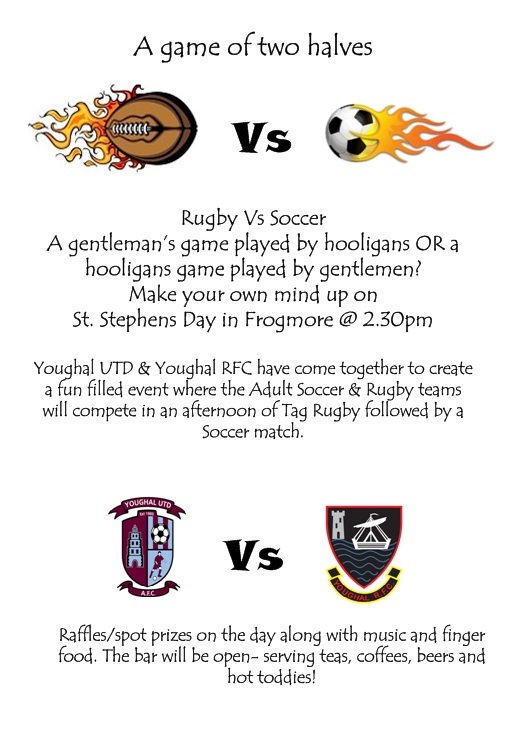 On behalf of the Youghal R.F.C. 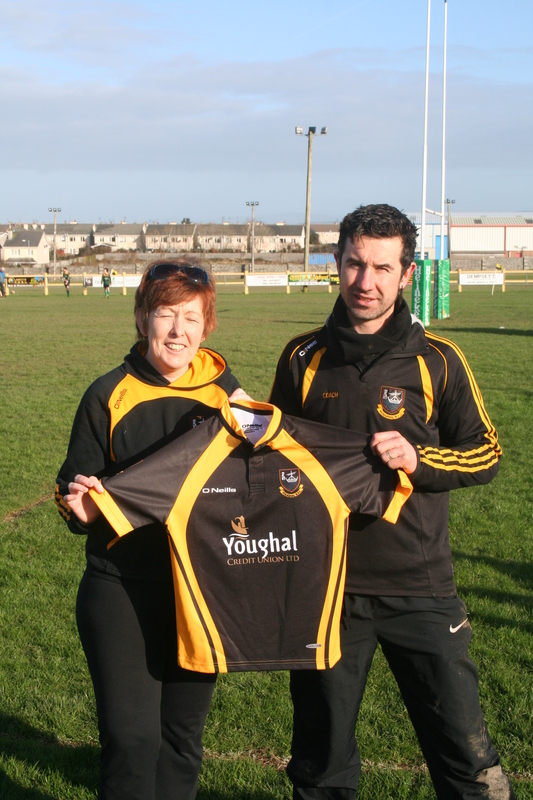 Minis section, we would like to express our sincere gratitude towards Youghal Credit Union on their recent sponsorship of a set of playing jersey’s for our U12 age group. The jersey’s were given their first outing against Cobh Pirates last weekend and as can be seen from the photos enclosed, the jersey’s look fantastic. 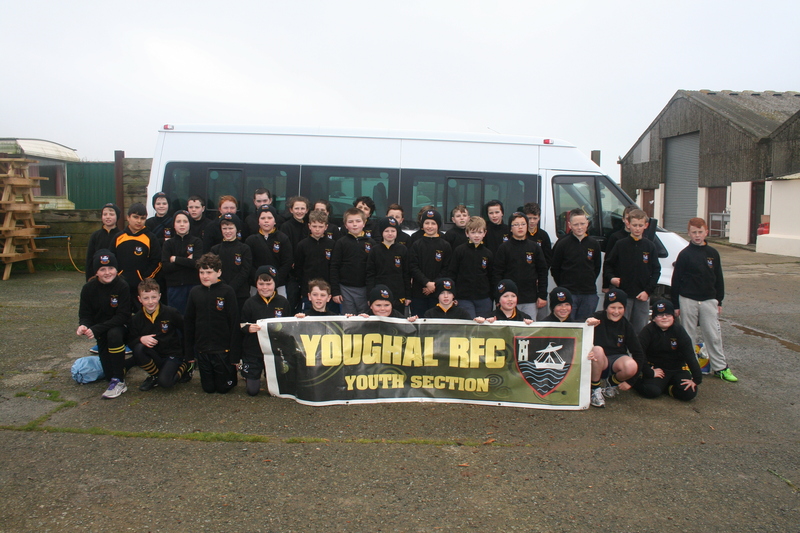 Youghal Minis section travelled to Douglas on Saturday morning the 11th of October last. It was a fantastic day weather wise and equally rugby wise and we would like to say a special thank you to the Douglas crew who looked after us very well on the day. We are back to training on Sunday mornings @ 11.15am for the next few weeks and new members are always welcome. Youghal and Douglas did a bit of mixing and matching at this age grade just to make sure everyone got some game time and we split into 2 groups. In the first group the game got off to a hectic start with Evan McNamara going over for Youghal after some great support running from Jacob Dignam. After some super tackling from Darragh Ryan, the ball got turned over and some lovely passing from Rian Power saw Jacob score a beauty in the corner. Not to be outdone, Darragh Ryan saw himself at the end of a lovely move after a great pass from Evan put him over for a try. The move of the match however came after some superb support play from the entire team resulting in Rian going over the line for a very well taken score. Some fabulous rugby was played and the passing and support play was fantastic – well done to all involved. In the second group, Douglas tipped off and some great defending by Nadia O’Shea and Conor Ward leads to Douglas losing the ball. Youghal tip off great play from Aaron Dignam and Eva leads to the games first try by Conor Ward. Next phase of play sees Douglas going forward but great defending by Cullen (Douglas player) leads to Eva Curran getting the ball and going over for Youghals second try. Douglas tip off, good passing and fast running leads to Douglas’s first try. Youghal soon get over the line again from fine running by Nadia Fitzgerald and Eva Curran with Aaron Dignam going over for Youghals third try. Half time 3-1. Youghal tip off but from strong pressure by Douglas they win the ball and go over for their second try. Youghal tip off and some fast thinking by Eva Curran gets the ball to Nadia Fitzgerald who gets the ball Conor Ward to score his second try. With Youghal playing well now they soon get the rewards with some neat play from Aaron, Conor and Eva leading to Nadia O’Shea getting another try. Douglas tip off and from good play score their third try. 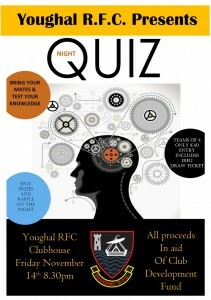 Next phase sees Youghal score another try following great team play. With the last phase of play saw Nadia racing up the wing scoring a great try to see out the game. A great game by all involved. What a great day Saturday turned out to be, the sun was shining and lots of rugby to be played. The U9’s turned up with 5 players and after a brief talk they would take on the might of Douglas RFC with the fighting spirit that is youghal RFC. PJ Morgan, Jamie Lee, Ryan Hammill, Oisin Ryan and Lui phipps lined up with the memory of the defeat to Fermoy still in their gut and raring to go. Douglas graciously gave us 3 players but by the look of hunger on PJ’s face maybe we didn’t need them. Douglas got off to a great start and went on a quick surge looking for the opening score but superb tackling by Oisin meant the ball was quickly turned over and PJ was on hand to make a dash up the pitch followed by Jamie who got in for a great try. The tempo had been set and with Jamie calling the line, Youghal had structure in the ranks and this showed by two more tries in the first 10 when the ref called a halt to a great first period by Youghal. The 2nd period saw Oisin and Lui continue with that Youghal spirit of never give up when Douglas scored two unanswered tries. As Douglas went on the attack again, up popped Oisin with a great tackle and the ball was stolen by Lui who ran up the blind side to squeeze in a try. Ryan then duly set up the ever present PJ who powered his way over to try no 4. Ryan threw all the line out balls with such perfection that Youghal got to score two tries from our own end line directly from Ryan’s accuracy. Youghal finished the game with true grit and kept Douglas from getting over the line even under huge pressure. So in all, Jamie led like a true captain, PJ was solid in attack as in defence, Oisin and Lui played like a superb 12 + 13 duo and Ryan unselfishly set up his team mates all match. Many thanks to Douglas for lending us players so a rugby game could be played in a fantastic spirit. Our U10’s travelled to Douglas last Saturday but due to various other sporting events taking place on the same day, the numbers were slightly down. We started the game with 5 players and 3 from Douglas to make the game 8 a side. The game was played over 4 quarters @ 10mins a side so the lads would definitely sleep soundly that night! Kyle Fitzgerald got the opening try of the game and he also added 4 more over the course of the game. Daniel Murray almost made the line twice after 2 brilliant runs the full length of the pitch only to be brought to the ground just shy of the line but not before popping the ball up beautifully to Alex Kennedy and nothing was going to stop him that close to the try line. Luke O’Shea and Fionn Dalton were superb in defence all day long with each of them making superb try saving tackles as Douglas went in search of some scores. 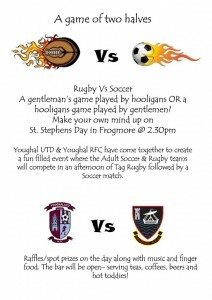 The Douglas lads on the Youghal team (Youglas!!) even scored a couple of tries against their team-mates but it didn’t matter as a great morning of rugby was enjoyed by all. Our 2nd away match in as many weeks saw a return to “form” and a much improved performance on the previous weeks match against Fermoy. From the start, our tackling stopped Douglas from making any serious threats to our line, but it was our competitiveness at the rucks and mauls that proved the decisive element to the match, not only did we secure our own ball but frequently managed to counter ruck and win Douglas ball. A regular supply of quality ball, some elusive and strong running saw Cathal Hunt, Conor O`Keeffe (twice) and Conor Roche all score tries from long distance. The score at the end of the 1st period was 0 – 4. The final period saw Conor`s loan period end and him restored to his rightful place and our dominance also restored. Enda scored 2 further tries before Conor O`Keeffe was on the end of the most pleasing score of the match, one that was a real team effort rather than an individual effort. Enda added his 3rd and final try of the match before the referee decided that time was up. Check out the Youghal Minis newsletter volume II for the latest goings on in the Minis section including a calender of events up to Christmas.